"Continental Divide" redirects here. For other uses, see Continental divide (disambiguation). The Continental Divide (also known as the Great Divide, Western Continental Divide or more elaborately, the Continental Divide of the Americas) is the principal, and largely mountainous, hydrological divide of the Americas. The Continental Divide extends from the Bering Strait to the Strait of Magellan, and separates the watersheds that drain into the Pacific Ocean from those river systems that drain into the Atlantic Ocean (including those that drain into the Gulf of Mexico and the Caribbean Sea) and, along the northernmost reaches of the Divide, those river systems that drain into the Arctic Ocean. Though there are a few other hydrological divides in the Americas, the Continental Divide is by far the most prominent of these because it tends to follow a line of high peaks along the main ranges of the Rocky Mountains and Andes, at a generally much higher elevation than the other hydrological divisions. The Continental Divide begins at Cape Prince of Wales, Alaska, the westernmost point on the mainland of the Americas. The Divide crosses northern Alaska into the Yukon, then zig-zags south into British Columbia via the Cassiar Mountains and Omineca Mountains and northern Nechako Plateau to Summit Lake, north of the city of Prince George and just south of the community of McLeod Lake. From there the Divide traverses the McGregor Plateau to the spine of the Rockies, following the crest of the Canadian Rockies southeast to the 120th meridian west, from there forming the boundary between southern British Columbia and southern Alberta. 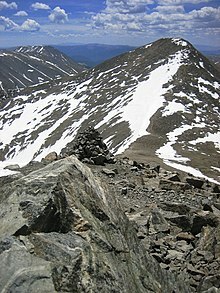 Grays Peak, here in mid-June 2007, at 14,278 ft it is the highest point of the Continental Divide in North America. Historically, the Continental Divide was the line between British and US land possession in the disputed Oregon Country. The Divide crosses into the United States in northwestern Montana, at the boundary between Waterton Lakes National Park and Glacier National Park. In Canada, it forms the western boundary of Waterton Lakes National Park, and in the US bisects Glacier National Park. Further south, the Divide forms the backbone of the Rocky Mountain Front (Front Range) in the Bob Marshall Wilderness, heads south towards Helena and Butte, then west past the namesake community of Divide, Montana, through the Anaconda-Pintler Wilderness to the Bitterroot Range, where it forms the eastern third of the state boundary between Idaho and Montana. The Divide crosses into Wyoming within Yellowstone National Park and continues southeast into Colorado where it reaches its highest point in North America at the summit of Grays Peak at 4,352 m (14,278 feet). [ citation needed] It crosses US Hwy 160 in southwestern Colorado at Wolf Creek Pass, where a line symbolizes the division. The Divide then proceeds south into western New Mexico, passing along the western boundary of the endorheic Plains of San Agustin. Although the Divide represents the height of land between watersheds, it does not always follow the highest ranges/peaks within each state or province. In Mexico, it passes through Chihuahua, Durango, Zacatecas, Aguascalientes, Jalisco, Guanajuato, Querétaro, México, the Federal District, Morelos, Puebla, Oaxaca, and Chiapas. In Central America, it continues through southern Guatemala, southwestern Honduras, western Nicaragua, western/southwestern Costa Rica, and southern Panama. The divide reaches its lowest natural point in Central America at the Isthmus of Rivas at 47 m (154 feet) in Nicaragua. In Panama, the Canal cuts through it at 85 ft (26 m). The Divide continues into South America, where it follows the peaks of the Andes Mountains, traversing western Colombia, central Ecuador, western and southwestern Peru, and eastern Chile (essentially conforming to the Chile- Bolivia and Chile- Argentina boundaries), southward to the southern end of Patagonia and Tierra del Fuego. 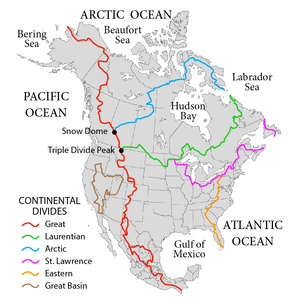 In North America, another, mainly non-mountainous divide, the Laurentian Divide (or Northern Divide), further separates the Hudson Bay- Arctic Ocean drainage region from the Atlantic watershed region. Secondary divides separate the watersheds that flow into the Great Lakes and Saint Lawrence River (ultimately into the Atlantic) from watersheds that flow to the Atlantic via the Missouri-Mississippi complex. Another secondary divide follows the Appalachian chain, which separates those streams and rivers that flow directly into the Atlantic Ocean from those that exit via the Mississippi River. Triple Divide Peak in Glacier National Park, Montana, is the point where two of the principal continental divides in North America converge, the primary Continental Divide and the Northern or Laurentian Divide. From this point, waters flow to the Pacific Ocean, the Atlantic Ocean via the Gulf of Mexico, and the Arctic Ocean via Hudson Bay. Most geographers, geologists, meteorologists, and oceanographers consider this point the hydrological apex of North America, as Hudson Bay is generally considered part of the Arctic. For example, the International Hydrographic Organization (in its current unapproved working edition only  of Limits of Oceans and Seas) defines the Hudson Bay, with its outlet extending from 62.5 to 66.5 degrees north (just a few miles south of the Arctic Circle) as being part of the Arctic Ocean, specifically "Arctic Ocean Subdivision 9.11." This hydrological apex of North America status of Triple Divide Peak is the main reason behind the designation of Waterton-Glacier International Peace Park as the "Crown of the Continent" of North America. The summit of the peak is the world's only oceanic triple divide point. Discounting Antarctica and its ice sheets, only one other continent ( Asia) borders three oceans, but the inward-draining Endorheic basin area of Central Asia from western China to the Aral and Caspian Seas is so vast that any Arctic and Indian Ocean tributaries are never within proximity of each other. Thus, North America's status of having a single location draining into three oceans is unique in the world. If Hudson Bay is considered part of the Atlantic, then the triple point is at an unimportant-looking, permanently snow and ice covered hump on the border between Alberta and British Columbia, on the southern slope of Snow Dome at 3,456 metres (11,300 ft). The exact location of this potential triple point is somewhat indeterminate because the Columbia Icefield and the snow on top of it shifts from year to year. The snow that falls on it (about 10 metres (33 ft) per year) does not actually flow downhill as water, but creeps downhill in the form of glacial ice. While Triple Divide Peak (or, alternatively, Snow Dome) is the world's only oceanic triple divide, there are secondary triple divide points wherever any two continental divides meet. North America could be considered to have five major drainage systems: into the Pacific, Atlantic and Arctic Oceans, plus Hudson Bay and the Gulf of Mexico. Other sources such as the International Hydrographic Organization add a sixth: Canada's Northwest Passage basin. Using just the five, there are four secondary continental divides and three secondary triple points, the two mentioned previously and a third near Hibbing, Minnesota, where the Northern Divide intersects the Saint Lawrence Seaway divide. Since there is no true consensus on what a continental divide is, there is no real agreement on where the secondary triple points are located. However, the main Continental Divide described in this article is a far more distinctive geological feature than the others and its two main triple points are much more prominent. The Continental Divide Trail often remains above the treeline and on the Divide, providing unobstructed views along its route. Many endorheic regions in North and South America complicate the simple view of east or west, "ocean-bound" water flow. Several endorheic basins straddle or adjoin the Continental Divide, notably the Great Divide Basin in Wyoming, the Plains of San Agustin and the Animas Valley in New Mexico, the Guzmán Basin in New Mexico and Chihuahua, Mexico, and both the Bolsón de Mapimí and the Llanos el Salado in Mexico. Such basins can be, and routinely are, assigned to one side of the Divide or the other by their lowest perimeter pass; in other words, an assignment is made by determining how the drainage would occur if the basin were to be progressively filled with water until it overflowed. Large-scale maps, such as those on this page, often show double divide lines when endorheic basins are involved. However, the detailed USGS topographic maps of the United States generally show only the main Divide as determined by the overflow rule. Among other things, this eliminates the need to trace out the boundary for a basin that is very shallow and has a nebulous rim, such as the San Luis Closed Basin in Colorado and the sink of the lost streams of Idaho. Another rare exception occurs when a stream near a divide splits and flows in both directions, or a lake straddling the divide overflows in both directions. Examples of these are, respectively, North Two Ocean Creek and Isa Lake, both located on the Continental Divide in Wyoming. The Panama Canal has this same feature, but is man-made. Both the Chagres and Gatun rivers flow into Gatun Lake, which empties to both oceans. The Alpine Club of Canada's Abbot Pass Hut sits directly astride the Divide in Abbot Pass on the boundary between Banff National Park and Yoho National Park, and thus rainwater falling on the eastern half of the roof flows via Lake Louise into Hudson Bay, while rain falling on the western half flows via Lake O'Hara into the Pacific Ocean. ^ "IHO Publication S-23 Limits of Oceans and Seas; Chapter 9: Arctic Ocean". International Hydrographic Organization. 2002. Retrieved 2017-07-01. ^ "State of Flathead Lake". University of Montana Flathead Lake Biological Station. Retrieved 2015-09-28. ^ a b "Ocean Triple Divide Points". Peakbagger.com. Retrieved 2017-07-01. ^ Sanford, Robert W. (2010). Our World's Heritage: Creating a Culture Worthy of Place in Canada's Western Mountain Parks. Athabasca University Press. p. 160. ISBN 978-1-897425-57-2. ^ Lewis, Edward Lyn; Jones, E. Peter; et al., eds. (2000). The Freshwater Budget of the Arctic Ocean. Springer. p. 101. ISBN 978-0-7923-6439-9. Retrieved 26 November 2010. ^ Timmer, Henry (2006). "Snow Dome - The Hydrological Apex of North America". Snow Dome. climbwild.net. Retrieved 2007-12-28. ^ Timmer, Henry. "The Columbia Icefield". climbwild.net. Retrieved 2014-07-30. ^ "Snow Dome-South Slope, British Columbia". Peakbagger. Retrieved 2015-09-28. ^ monica driscollian rivers atlas (2006). "Minnesota Rivers Map". Minnesota State Map Collection. Geology.com. Retrieved 2007-12-29. ^ Gonzalez, Mark A. (2002). "Continental Divides in North Dakota and North America" (PDF). NGDS Newsletter. North Dakota Geological Survey. Archived from the original (PDF) on 2013-01-17. Retrieved 2007-12-29. ^ Lynx, Dustin (2000). Hiking Canada's Great Divide Trail. Rocky Mountain Books. ISBN 0-921102-79-8. ^ GeoBC (2013). "Committee Punch Bowl". gov.bc.ca. Province of British Columbia. Retrieved 2014-09-29.